NEW! 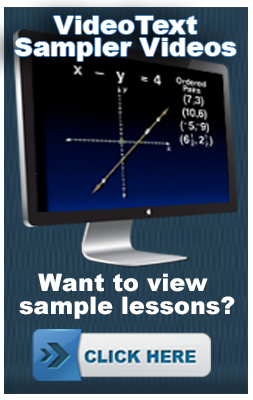 An Even Easier Way to Stay on Track with VideoText Lesson Plans! VideoText is pleased to announce that through our partnership with the Homeschool Buyers Co-op, the creator of Homeschool Planet, we are now able to offer users not only the best math curriculum on the market, but the best way to stay on track and generate the records your state may require — attendance, grading reports, and the like – automatically and easily! While VideoText users have been able to enjoy the self-paced nature of our programs since the beginning, we have occasionally heard from users who would like even more help with the day-to-day structure of implementing student material. That help is now possible! Users of VideoText Online Courses can take full advantage of their online subscription with the official, VideoText Interactive lesson plans for use with Homeschool Planet, the popular, rave-reviewed online planner just for homeschoolers. For more information on this exciting new opportunity, CLICK HERE!